Love ‘em or hate ‘em, the island’s colorful chickens are an iconic part of Key West. Whether you’re on the beach or roaming around Old Town, it won’t be long before you encounter them. Some Conchs love the chickens. They believe they make Key West the unique destination that it is and part of the Old Key West that everyone talks about. Other Conchs hate them, saying they’re unsanitary and a nuisance. After all, the roosters do crow at all hours, and not just at the crack of dawn. In fact, the island is so divided over the existence of the animals that a “chicken war” broke out over 15 years ago. And it’s still going on. The chickens are such a source of contention on the island because of their long history in Key West, the majority of the chickens arriving in the 1800s. The story goes that Cuban settlers brought the chickens to the island, not only as a source of food, but also for sport. While hens were prized for their eggs, the roosters were prized for their cockfighting, making for good back-alley entertainment. 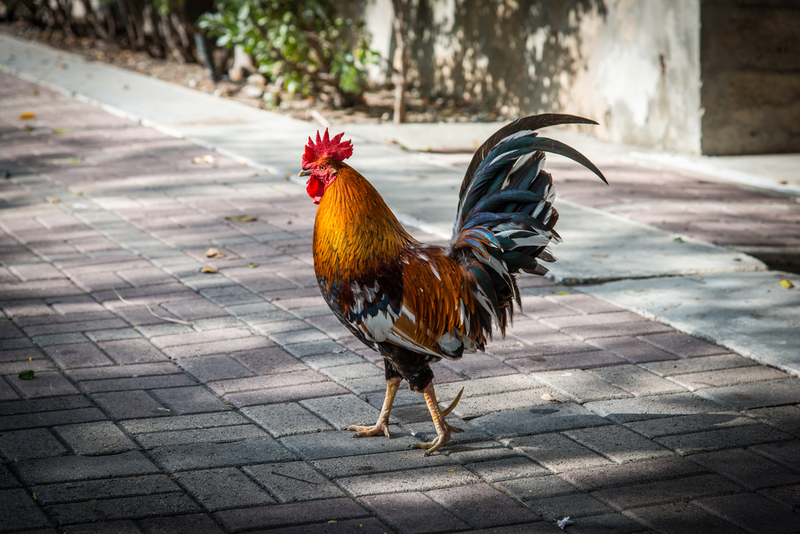 All was fine and dandy until cockfighting was outlawed in Key West in the 1970s, leaving many roosters without purpose and set to aimlessly roam the streets of Key West. Without much to do, the chickens kept breeding – so much so that the chicken population was considered out of hand by the mid-2000s. In fact, there were so many that the chickens were spreading to the nearby Keys. Not surprisingly, it was around this time that the Chicken War broke out. So while locals argue whether the chickens should stay on Key West, the animals roam free, living the good life, eating from local restaurants, soaking up the sun, and meeting tourists. The gypsy chickens are all over Key West, yet they do tend to congregate in certain places more than others – especially in the restaurant Blue Heaven. Along with the cats, the chickens here rule the roost. You might recall that we’ve recommended Blue Heaven before, specifically for their key lime pie. Just know that if you come here, you’ll probably have to share with the island’s two-legged friends. As for our take on the matter, whether you like the chickens or not, the chickens probably aren’t going anywhere anytime soon. The Chicken War will go on.